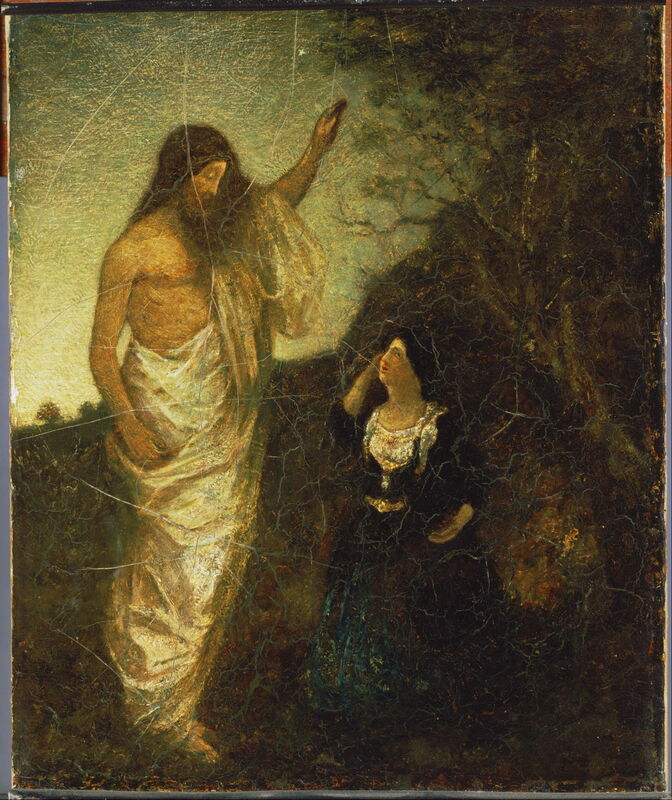 Albert Pinkham Ryder (1847–1917), Resurrection (1885), oil on canvas, 17.1 x 14.1 cm, The Phillips Collection, Washington, DC. Wikimedia Commons. So far, this series has concentrated entirely on oil painting in Europe, and until about 1800, the vast majority of fine art works painted using oil paints were confined to Europe. During the nineteenth century, increasing numbers of artists around the world were turning to oil paints for their work. I have traced the long history of European-style painting and the introduction of oils to Japan in another series here. In short, interest in oil painting led to a kernel of leading painters going to train in Europe. They brought back the materials and techniques which they had learned, and then became the teachers in Japan. This article focuses on developments in America, which were to become so important with the advent of Modernism in the twentieth century. As in Europe during the nineteenth century, this period saw an unprecedented emphasis being placed on the intent of the artist, sometimes to the neglect of the craft. Although Europe had long since abandoned the exclusivity of the Guilds of Saint Luke, which had served to protect and preserve the crafts involved in oil painting, the great majority of painters in Europe were taught by older, more experienced painters, who instilled in the next generation the skills and procedures which had developed over the centuries. Significant departure from the tradition were, therefore, unusual, even among the rebellious Impressionists. America was different. It was geographically isolated: although some American painters were able to study in established academies in Europe, for many that was simply not possible. There was also a growing sense of national identity, of freedom, exploration, and innovation, which encouraged some painters to develop their own ideas, driven by their artistic intent, rather than any craft tradition. Many American artists – like William Merritt Chase (whose centenary we are celebrating) and his colleagues, for instance – obtained their first instruction in the craft and art of oil painting in reputable, established schools in North America, before spending several years in Europe improving their skills further. By and large, they worked with established materials, and used proven techniques which have resulted in many thousands of superb and durable paintings in which they developed their art. Sometimes, American students found their access to European teaching was limited, and their most accessible teachers were not, perhaps, the most appropriate. Thomas Couture (1815-1879) set up his own academy in opposition to the established École des Beaux-Arts in Paris; while gaining admission to the latter was an impossible attainment for almost all American students, many were able to obtain teaching from Couture. His techniques were somewhat eccentric, and many students found them hard to follow. Elizabeth Boott (who was to marry Frank Duveneck) felt that “a strict adherence to the Couture method was impossible to all but Couture himself”. 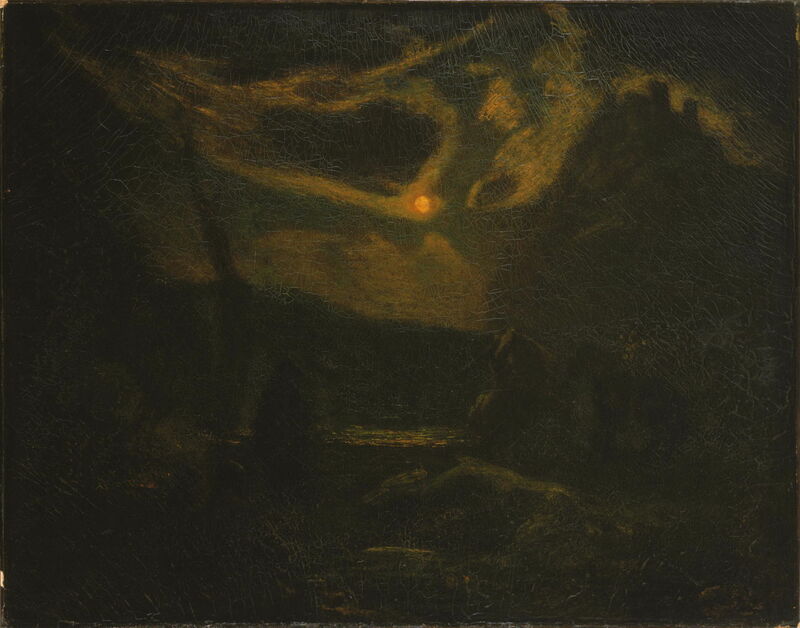 Ralph Albert Blakelock (1847–1919) was a contemporary of Chase and Duveneck who had dropped out of medical studies, and became a largely self-taught artist. His paintings were considered to be both highly individual and very innovative at the time, but so was his technique. He was reported to apply thin layers of paint to start with, and leave them until part dry. He then flattened them with a palette knife, and wiped wispy forms from them, before leaving them to dry more fully. He repeated applications of layers in this way, but when the surface became gummy or over-glazed, he would scrape it using a pumice stone (the coarse bone from a cuttlefish). Varnish became mixed in with his layers, and conservators now find them impossible to clean because of the danger of structural damage to the paint layer. Ralph Albert Blakelock (1847–1919), Above the Clouds (c 1875-78), oil on canvas, 29.2 x 24.1 cm, Indianapolis Museum of Art, Indianapolis, IN. Wikimedia Commons. Above the Clouds (c 1875-78) is a small oil painting of his on canvas, which has probably undergone significant tonal change. As shown in the detail below, its surface has some gaping cracks and many other irregularities, at least some of which appear unintentional. 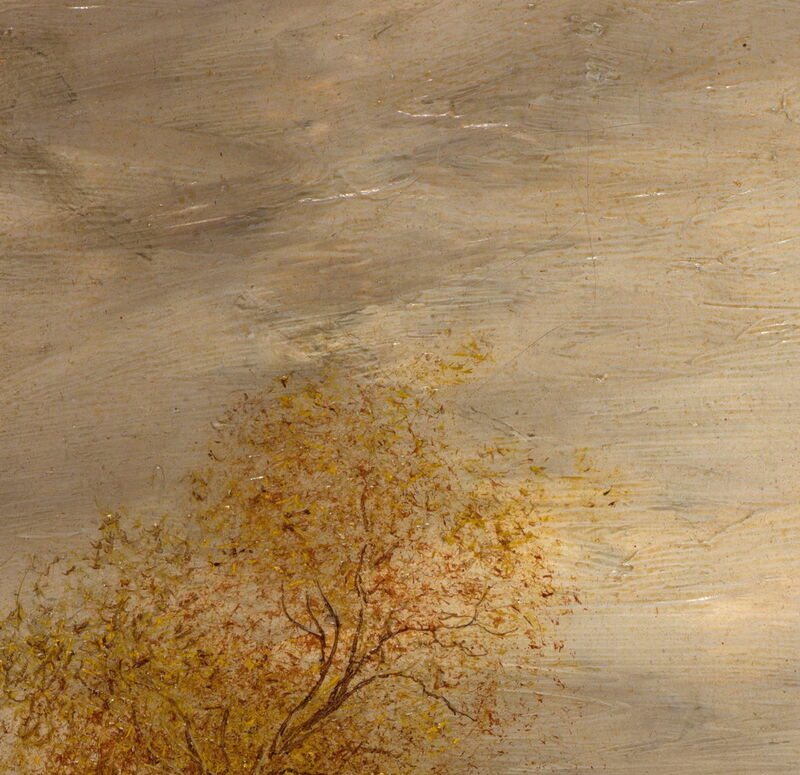 Ralph Albert Blakelock (1847–1919), Above the Clouds (detail) (c 1875-78), oil on canvas, 29.2 x 24.1 cm, Indianapolis Museum of Art, Indianapolis, IN. Wikimedia Commons. 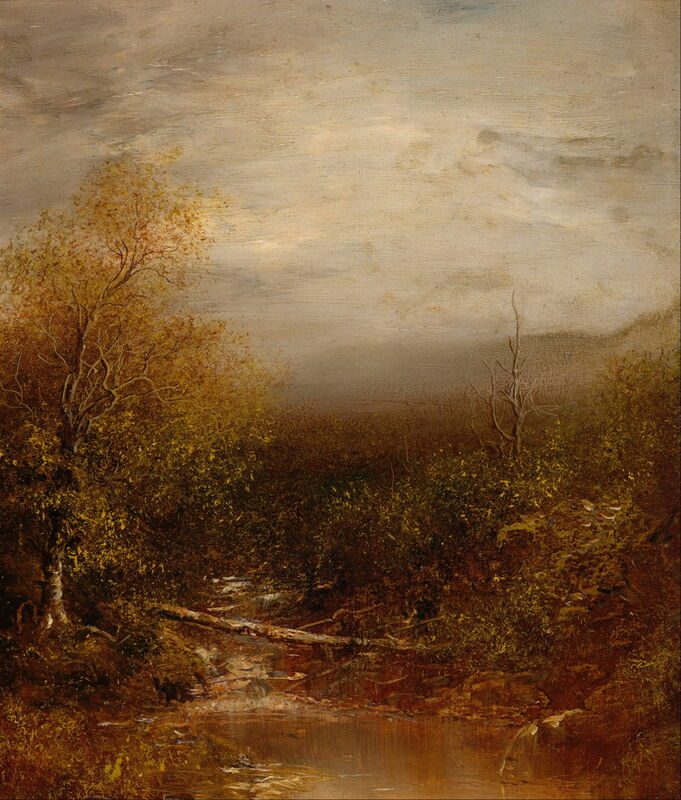 Ralph Albert Blakelock (1847–1919), Pool in the Adirondacks (c 1875-78), oil on canvas, 30.5 x 25.4 cm, Indianapolis Museum of Art, Indianapolis, IN. Wikimedia Commons. Pool in the Adirondacks (c 1875-78) is of similar size, and shows various surface defects including fine and gaping cracks (see detail below). Ralph Albert Blakelock (1847–1919), Pool in the Adirondacks (detail) (c 1875-78), oil on canvas, 30.5 x 25.4 cm, Indianapolis Museum of Art, Indianapolis, IN. Wikimedia Commons. 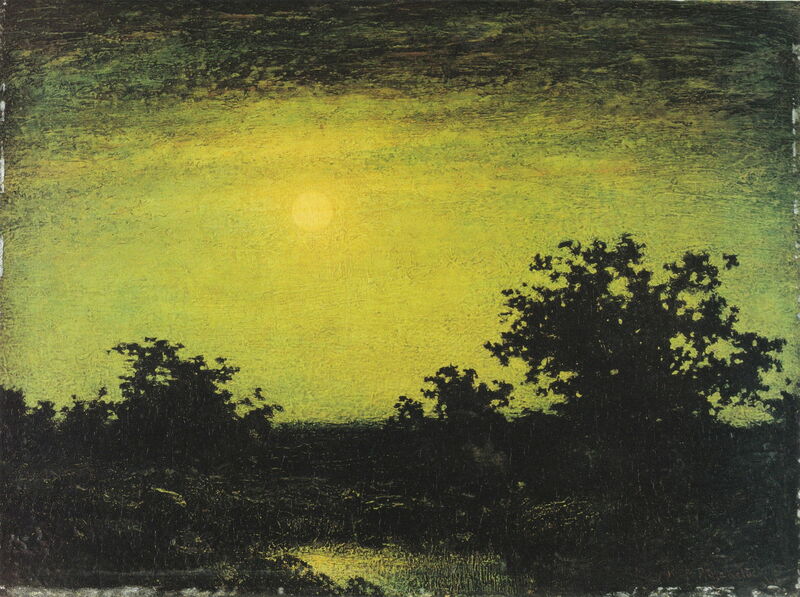 Ralph Albert Blakelock (1847–1919), Moonlight (c 1885-90), oil on board, 30.5 × 40.6 cm, Columbus Museum of Art, Columbus, OH. Wikimedia Commons. 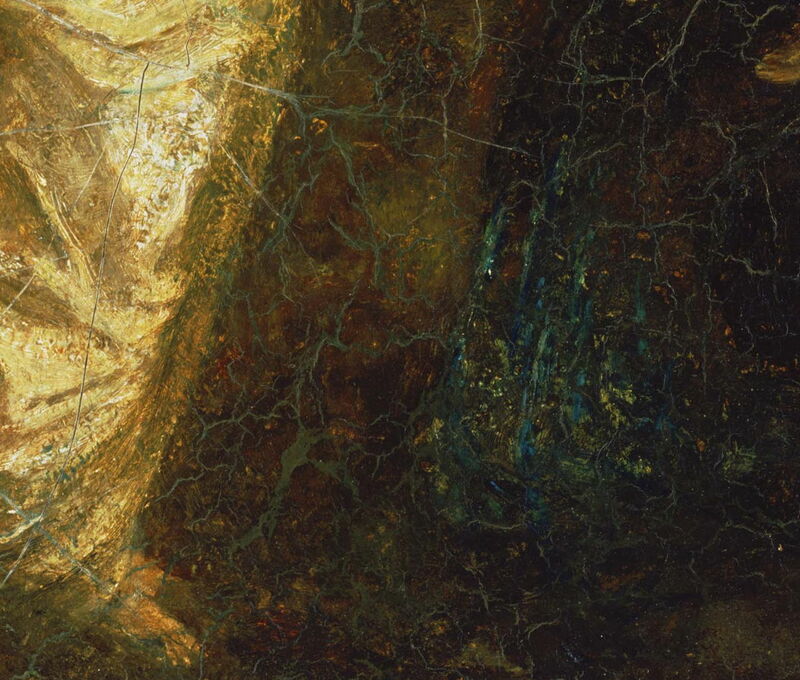 Some of his later paintings, such as his Moonlight (c 1885-90), very slightly larger in size, are suffering worse, with extensive areas of cracking and other problems in the paint layer (detail below). 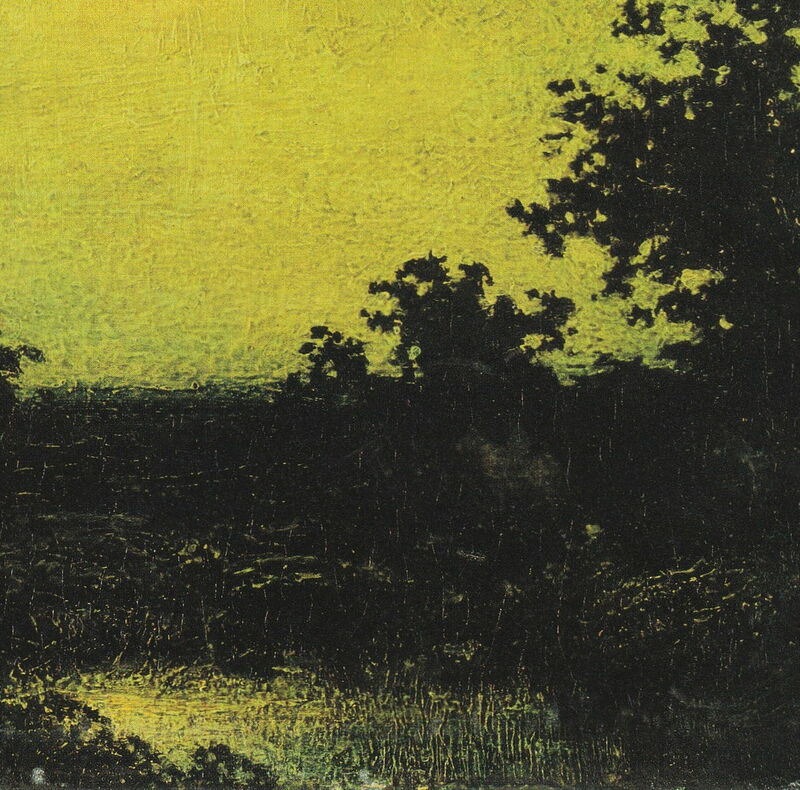 Ralph Albert Blakelock (1847–1919), Moonlight (detail) (c 1885-90), oil on board, 30.5 × 40.6 cm, Columbus Museum of Art, Columbus, OH. Wikimedia Commons. 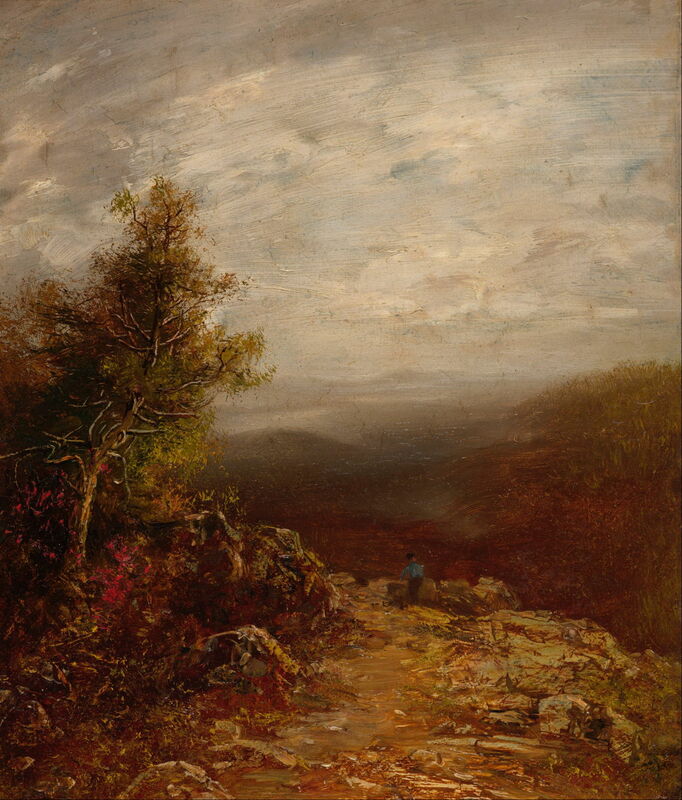 Albert Pinkham Ryder (1847–1917) was another contemporary who studied in New York at the National Academy of Design during the early 1870s, and travelled to Europe four times, although when there he did not apparently undergo any training as such. He was also a close and longstanding friend of Julian Alden Weir, who trained at the École des Beaux-Arts under Jean-Léon Gérôme and was conservative in his technique. Ryder apparently became obsessed with creating unique optical effects in his oil paintings, in the course of which he abandoned the discipline of craft. He interlayered oil, resin, wax, non-drying oils, and protein-rich materials in his paint layers. Even in his lifetime many suffered disastrous cracking, which he claimed that he did not mind. Few of his paintings are either structurally stable or readable any more, and the best record of the artist’s intent is now old monochrome photographs taken of them before their deterioration became as bad. 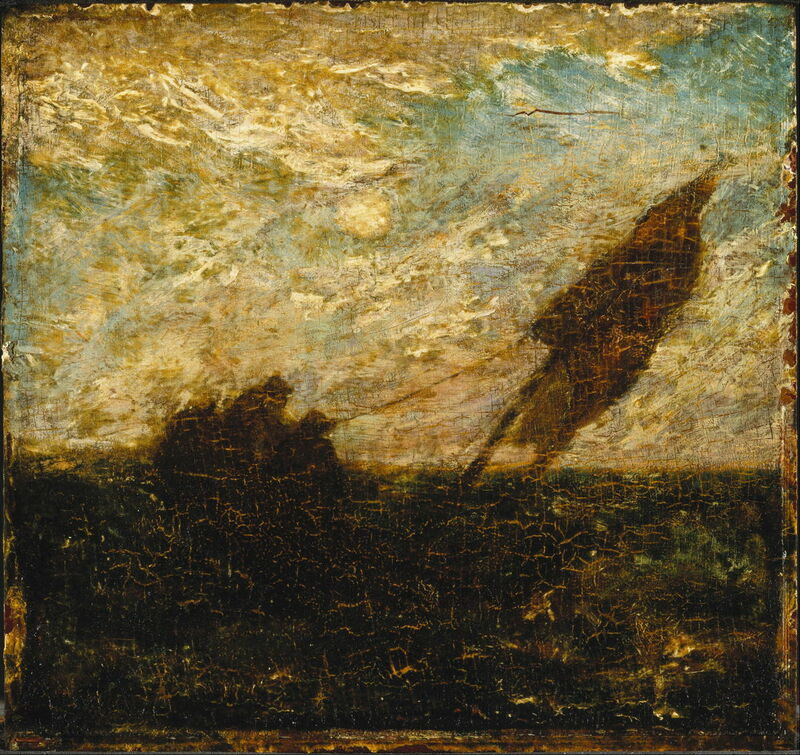 Albert Pinkham Ryder (1847–1917), The Waste of Waters is Their Field (c 1883), oil on panel, 28.8 × 30.5 cm, Brooklyn Museum, New York, NY. Wikimedia Commons. The Waste of Waters is Their Field (c 1883) is a small oil painting which is almost completely lost now, with much of the detail merged into a dark brown mess as its superficial layers have faded, and the deeper layers darkened. The detail below shows that its entire paint layer is dissected by cracks, many of them gaping and oozing lighter wet paint from below. 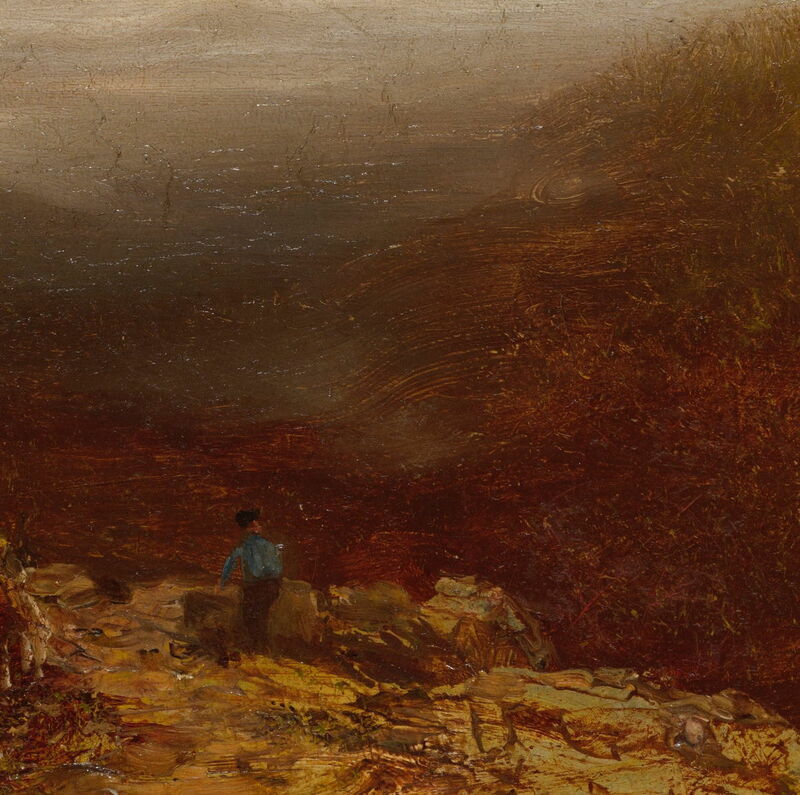 Albert Pinkham Ryder (1847–1917), The Waste of Waters is Their Field (detail) (c 1883), oil on panel, 28.8 × 30.5 cm, Brooklyn Museum, New York, NY. Wikimedia Commons. Details can still be made out in his tiny Resurrection (1885), although even this has changed and cracked severely. Many of the cracks are wide and filled with paint which has risen up from lower layers. Albert Pinkham Ryder (1847–1917), Resurrection (detail) (1885), oil on canvas, 17.1 x 14.1 cm, The Phillips Collection, Washington, DC. Wikimedia Commons. Albert Pinkham Ryder (1847–1917), Macbeth and the Witches (c 1895-1915), oil on canvas, 28.3 x 35.8 cm, The Phillips Collection, Washington, DC. Wikimedia Commons. 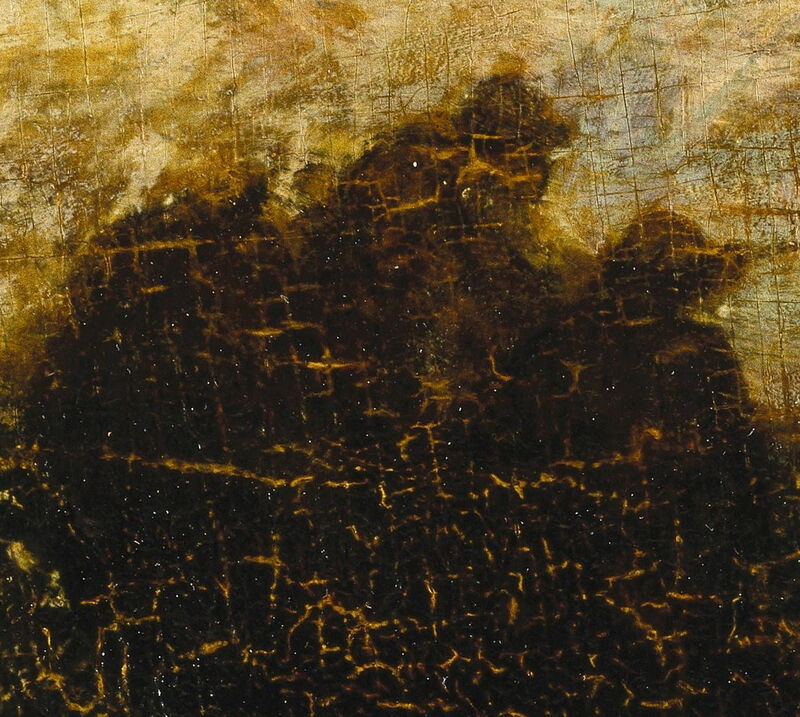 Macbeth and the Witches (c 1895-1915) has also become impossible to read, with its almost universal darkening and dense cracking across its paint layer. 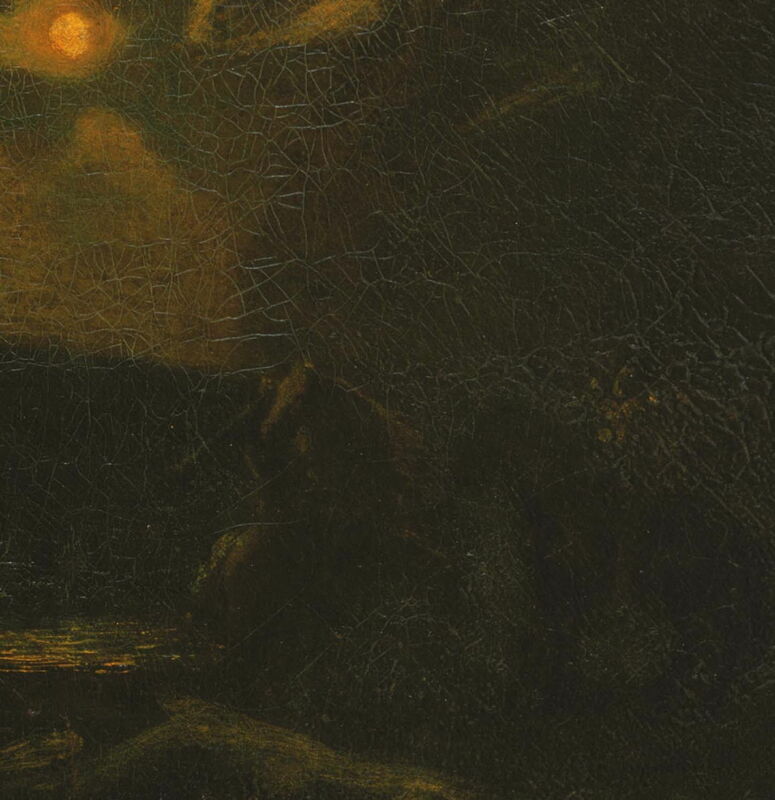 Albert Pinkham Ryder (1847–1917), Macbeth and the Witches (detail) (c 1895-1915), oil on canvas, 28.3 x 35.8 cm, The Phillips Collection, Washington, DC. Wikimedia Commons. Both Blakelock and Ryder were deemed important painters whose works were much admired during their lifetimes. Collectors invested heavily in their paintings, and one of Blakelock’s set the record for the highest price paid for the work of a living American painter, in 1916. Tragically those collections which gathered examples of their work are now left with paintings which are nothing like they were originally, whose recovery is technically impossible. Far from making painters more wary of the dangers of flawed practices, the rise of Modernist art in the twentieth century led to an unparalleled period of experimentation with materials which has left many more conservation problems. Investors and speculators have seemingly been undeterred from spending ever-increasing sums on paintings whose future looks brief, bleak, and profitable only to the conservation industry. This is despite the fact that in the twentieth century, we started at last to understand how oil paint ‘dries’, and the many complex dynamic processes which take place inside the paint layer. And it brought new materials which, used wisely, could make oil painting even more capable and durable. Mayer L & Myers G (2013) American Painters on Technique: 1860-1945, Getty. ISBN 978 1 6060 6135 0. Posted in General, Painting, Technology and tagged Blakelock, Boott, Chase, Couture, Duveneck, history of painting, modernism, oil paint, oil painting, Ryder. Bookmark the permalink.